Moses visited Miss Liza Jane Von Doggie recently. See picture in previous post. Moses is a Leonberger and at 7 months old and is 70 pounds. They are pals. He makes Liza Jane look like a miniature poodle instead of the standard she is. She definitely loved the idea of adding muscle to her pack. Moses owner is Liza Jane’s namesake. 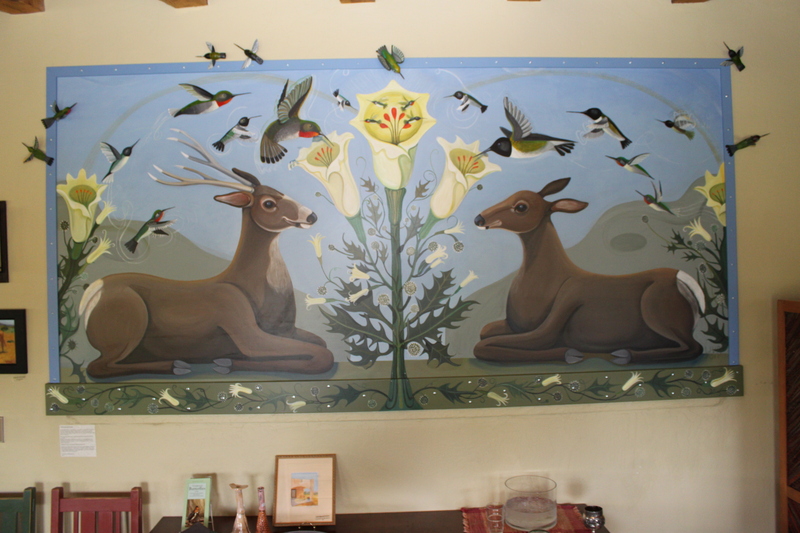 She created the great mural in the dining room. See pic. Here’s two recipes guests have asked from us. We were asked recently for three recipes for a new cookbook on New Mexico. It made me type them up and then we can share them with you.! Put the above ingredients in a large pot -add enough water to cover the chicken and poach till the chicken temperature is 170. Cool till the chicken is easy to handle or put in icebox overnight. Debone and skin chicken reserving the breast meat. Skim the fat from the broth. Discard. cook until sweet potatoes are done, don’t over cook the sweet potatoes, they will become mushy, fork tender is best. season to taste with salt , pepper, and maybe a bit of cumin. (We always tell the staff to taste what they are making-its important-recipes are guides, but not set in concrete. We serve with either roasted local veggies or melon. Fresh Corn or Blueberry Ricotta Pancakes serves 6- Summer, its corn from the Farmer’s Market and in the Winter,its frozen blueberries. Combine the wet and dry. heat griddle or cast iron pan add some butter or lots..and make some pancakes. Remember to turn the pancakes when the bubbles have formed. This entry was posted in Uncategorized on June 3, 2014 by bearmtnlodgenotes.